As an owner of a spa or salon, you want to pamper your customers in every way possible — but you don't want to spend a fortune on necessities like towels. Welcome to Towel Super Center, where you'll find 15 x 25 hand towels designed just for luxury spas and salons at affordable prices. These soft and thirsty towels absorb moisture and soothe delicate skin, but they are durable enough to withstand wash after wash. Discover the difference and buy our towels today! 100% cotton towels that last and last. Toss our towels in the washer and dryer, and you'll discover why they're so popular. Made with long and pure cotton fibers, our denser towels keep their size and shape. They also stay soft to the touch and incredibly absorbent. They're perfect for busy spas! Your complete towel needs in one convenient place. Towel Super Center carries a huge selection of soft, absorbent towels and mats! Our collection includes economy, premium and premium-plus towels and mats in multiple sizes, colors and fabric weights. Match your décor with ease when you shop at Towel Super Center! Wholesale pricing every day. When you buy spa towels from us, you can stock up affordably because you'll find prices as low as $7.99 per dozen. And because we pack our towels tightly for shipping, you'll save on delivery fees, too. Not a Spa Owner? You Can Still Order These Luxurious White Spa Hand Towels! Hotels: Talk about making your guests feel like royalty! They'll love the way these 15" by 25" hand towels glide softly across the skin, absorbing liquid without leaving the body feeling chafed or rough. Cruise Ships: Cruisers demand high-quality experiences, so give them what they expect. Outfit every room with premium spa grade hand towels. Be sure to use the towels to make cute animal creations, too! Medical Facilities: Do you run a clinic or healthcare facility where patients spend the night or stay for extended periods after treatments? 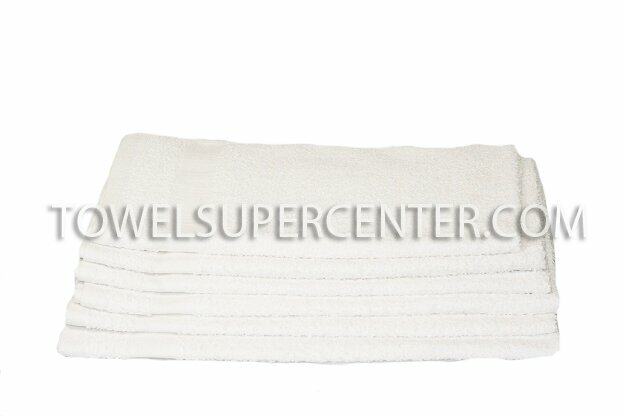 Offer them wholesale spa hand towels instead of cheaper ones that aren't made from 100 percent cotton fibers. Real Estate Staging Companies: Is your role to make any home on the market sell for at least asking price? Outfit all the bathrooms with luxurious towels, including white spa hand towels made from premium, plush cotton. Pet Groomers: Guess what? Pet parents notice if you use subpar towels on their "babies." Always have a supply of premium spa-type hand towels to use on your furry patrons, and you'll win the loyalty of their human companions. Corporations With Fitness Facilities: Have an on-site gym for your workers? Don't make them bring hand towels from home. Stock up on white spa hand towels instead. High-quality towels that last and low wholesale pricing every day make Towel Super Center the preferred online destination for spa and salon owners who expect value.